The Colosseum in Rome is one of the most iconic monumental, archaeological sites in the World; as well known as the pyramids in Egypt or the Great Wall of China. This is the largest and best preserved of all the surviving Roman amphitheatres, of which there are said to be around 230. The ruins of these ancient buildings can still be visited throughout what was the Roman Empire, from Wales in the west, to Syria in the east, Scotland in the north, and Libya in the south. Not all surviving amphitheatres are as spectacularly well preserved as the Colosseum (also known as the Flavian Amphitheatre). Although some are so well preserved they are still used for events and concerts today (the amphitheatre in Nîmes is just one these), others are quite fragmentary. 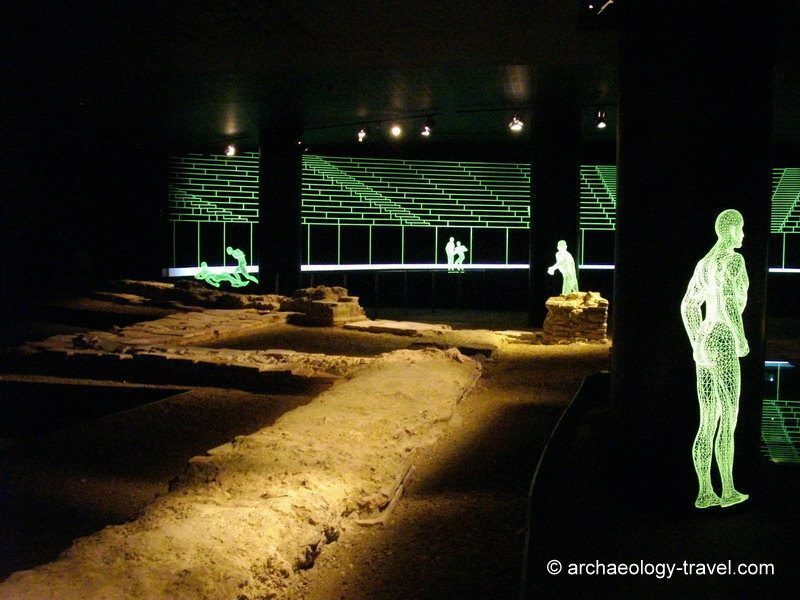 Of the recently discovered London amphitheatre, for example, all that remains on view in the basement of the Guildhall Art Gallery are the foundations of what served as the east gate to the arena. The manner in which these more modest remains have been prepared for display is quite exceptional – and for anyone exploring the history of this important city, this exhibition should not be overlooked. Remains of the Londinium amphitheatre. Some amphitheatres were much more elaborate than others, but the common, basic structure is an open-air oval arena that is surrounded by raised seating. Across the Empire they varied considerably in size, often reflecting the importance of the city or town which the building served. 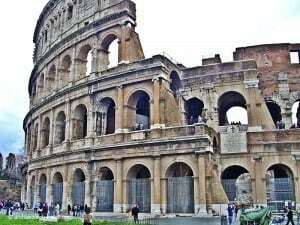 The Colosseum had an estimated seating capacity of between 50,000 and 80,000 people, while those amphitheatres in smaller Roman towns were only required to accommodate around 5,000 spectators. Essentially, amphitheatres were used for gladiator combats, chariot races, animal slaying and executions. 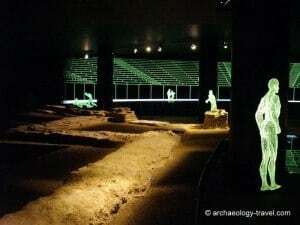 Other venues were used for other sporting and cultural activities: theatres were used for staging plays, pantomimes, choral events and orations; circuses and hippodromes for racing events; and stadia for athletics. Today amphitheatres are often confused with theatres, but there are differences between the two structures that relate principally to the events stages therein. As action was the order of the day in an amphitheatre, seeing that action was more important than hearing it. The reverse being true for theatres. Consequently, theatres tend to be smaller and have much better acoustics. Perhaps the most fundamental difference between a Roman amphitheatre and a Roman theatre is the shape, theatres have a semi-circular arrangement of raised seating looking into a stage, whereas an amphitheatre is a ‘theatre in the round’ – amphi is Greek for around. Where and when the first amphitheatres were built is not known, but it is thought the earliest amphitheatres were wooden structures. The earliest stone amphitheatres date to the late Republic period, and the most well known example, certainly one of the best researched amphitheatre, can be seen at Pompeii – built after 70 BC. After 27 BC, the start of the Imperial Era, the amphitheatre spread throughout the Empire. Amphitheatres not only became an important feature on the urban landscape, more crucially they played a significant role in the Romanisation of Provinces. For it was here that the Imperial cults and practices were played out in front of indigenous audiences. During the Imperial era amphitheatres became ever more more monumental and elaborate, with multi-storey, arcade façades decorated with marble and stucco cladding, statues and relief sculptures – everything we see at the Colosseum. The Colosseum as Christian Shrine. With the rise of Christianity in the Roman Empire, the kind of events staged in the amphitheatres attracted obvious disapproval. And, because Christian Romans then donated money to charity for divine reward in heaven, as opposed to Pagan Romans who funded public works and events to enhance their status, the financial support to stage the increasingly unpopular gladiatorial spectacles was difficult to find. As amphitheatres began to have fewer uses, and no funds to maintain them let alone build new ones, they fell into disrepair and were dismantled for building materials, vandalised, or demolished to make way for other buildings. Some (Arles and Leptis Magna) were transformed into fortified settlements, others (Nîmes and Tarragona) became Christian churches, and even the Colosseum became a Christian shrine, when in 1749 Pope Benedict XIV declared it a sacred site where Christians had been slain. Zoom in on the map to get a bird’s eye view of the amphitheatres. The varying degrees of preservation is immediately apparent when looking from above. Some of the amphitheatres, the satellite photograph permitting, are very well preserved and quite a few details can be seen – even from above. Others less so, but the general oval shape is easily discernible. In a few cases, Venafro in Italy or Agioi Deka in Greece, the amphitheatres were razed to the ground and other buildings constructed in its place – the shape and size of the amphitheatre can clearly be seen in the arrangement of the new buildings. The names of towns listed below correspond to the markers on the map above. Click on those town names in red to go through to a page for more information about the amphitheatre in that town.